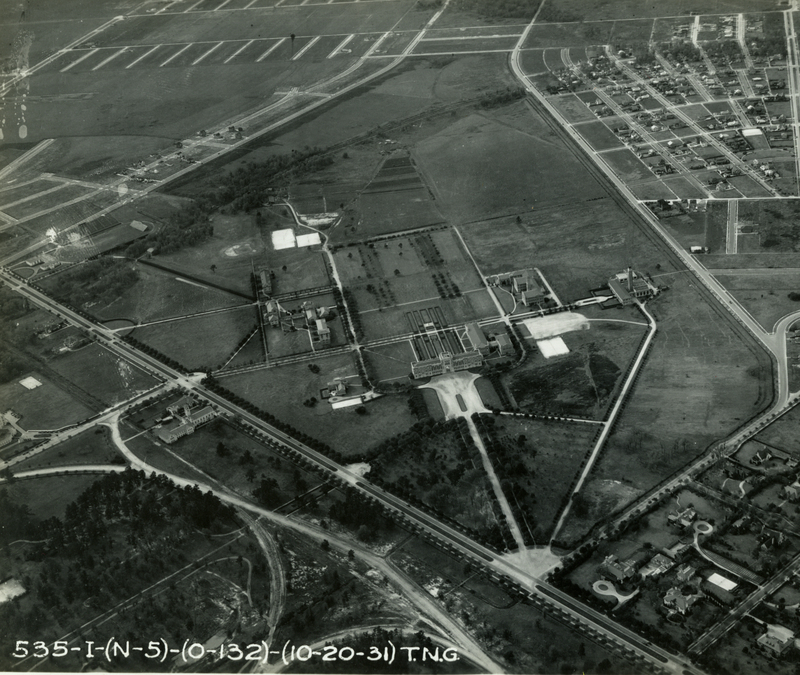 Here, miraculously, is an early aerial photograph with a date on it: October 20th, 1931. It’s a really good, clear image and it’s been taken from an unusual angle that lets us see the layout of the entire campus. Sure enough, if you click to zoom in you can see several small buildings in the most heavily wooded section along Harris Gully, near where Reckling Field is today. I can’t see everything because of the trees but the structures that I do see seem to line up with the blueprint that originally got me going on this. I’m pretty satisfied with this answer because it generally makes sense. What bothered me was this: how could I not have noticed an entire group of buildings that existed for decades on a small campus? The answer is 1) none of the people who left papers behind had any interest in talking about this, being preoccupied with things like building an academic institution and 2) there are very few images that show this relatively empty part of campus in this era. Quite sensibly, people who were making photographs wanted pictures of the impressive buildings rather than mule sheds. So, it adds up. This is an interesting picture in many other ways and I’ll give it much further study. Just for one example, you can really clearly see the curved line where the railroad spur had been. And are those row crops in the area to the right of the mule sheds?? Crops would make sense, it looks like there are paths from the mule sheds to that area. Plows? As a baseball junkie, what I like about the picture is that you can see the modest old baseball diamond in roughly the same place where new Wiess is located. Do you know what those big white areas are? Wow, what a great view. The big white areas to the right of the baseball diamond are at the location where there were tennis courts for many years, so this photo might have been taken as those courts were being built. Yes, this is really quite a spectacular picture. Days later I’m still staring at it. What is the building in the left center of the photo (SE corner of the campus)? Do you mean Cohen House? If you zoom in you can see its circular drive. Nope. I think he means the one in the center of the left-hand side, near the intersection of Main and University. There’s a very nice-looking semi-circular drive coming off of Main Street to a 2-3 story building with a couple of wings, sitting just off the athletic track. Is this an early gym? My Grandfather was Tony Martino’s right had man. My mom and Aunt actually lived on Rice’s campus. The picture shows their house which was located in the fork of the road near the tennis courts and baseball field. They can help fill in many gaps regarding the mules, barn, gully, and crops.